This was the first book I purchased when I was first in The Priory after my diagnosis. It became my bible and constant companion throughout the 5 weeks I was at The Priory. I would take it with me every time I went ‘off-site’ to go to Costa’s and would sit in the sun reading this book. I do highly recommend this book, if like me, you are looking for some extra help, but don’t care the casual approach. they all look different and have different names. 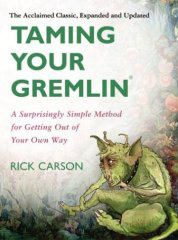 Rick Carson has a huge and loyal following in America, just visit the website and you will see how serious Gremlin Taming is.